The jugular foramen is a large foramen (aperture) in the base of the skull. It is located behind the carotid canal and is formed in front by the petrous portion of the temporal bone, and behind by the occipital bone; it is generally larger on the right than on the left side. Cranial nerves IX (glossopharyngeal), X (vagus), and XI (accessory) and the internal jugular vein pass through the jugular foramen. The jugular foramen may be subdivided into three compartments, each with their own contents. 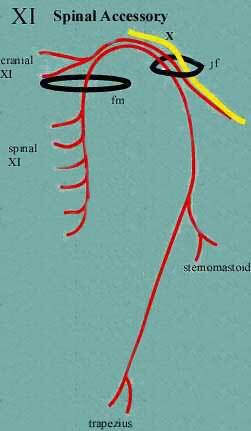 The intermediate transmits the glossopharyngeal nerve, the vagus and accessory nerves (aka cranial nerves number IX, X, and XI respectively). 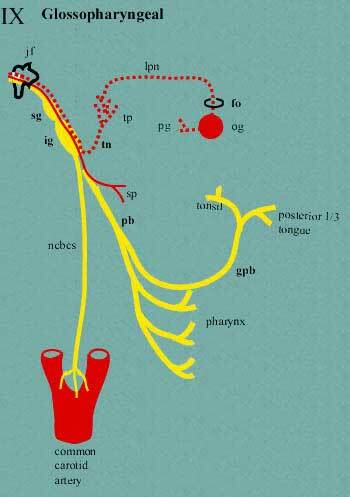 The posterior transmits the sigmoid sinus (becoming the internal jugular vein) and some meningeal branches from the occipital and ascending pharyngeal arteries. The smaller, anteromedial, "pars nervosa" compartment contains CN IX, (tympanic nerve, a branch of CN IX), and receives the venous return from inferior petrosal sinus. The larger, posterolateral, "pars vascularis" compartment contains CN X, CN XI, Arnold's nerve (or the auricular branch of CN X involved in the Arnold's reflex, where external auditory meatus stimulation causes cough), jugular bulb, and posterior meningeal branch of ascending pharyngeal artery. Obstruction can result in "Vernet's syndrome". Base of the skull. Upper surface. ^ "Parapharyngeal Masses: Their Diagnosis and Management". Archived from the original on 2008-09-07. ^ Erol FS, Kaplan M, Kavakli A, Ozveren MF (June 2005). "Jugular foramen syndrome caused by choleastatoma". Clin Neurol Neurosurg. 107 (4): 342–6. doi:10.1016/j.clineuro.2004.08.006. PMID 15885397. Wikimedia Commons has media related to Jugular foramen. "Anatomy diagram: 34257.000-1". Roche Lexicon - illustrated navigator. Elsevier. Archived from the original on 2012-07-22.